Humor heals. Know someone who's spirit needs a lift? They'll love this! 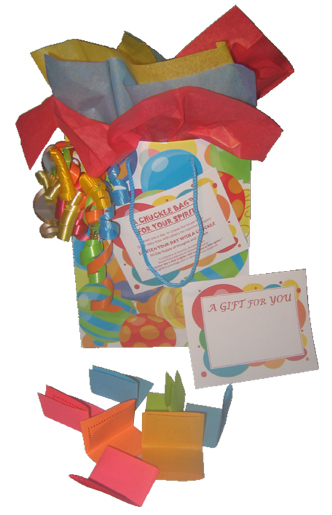 Each colorful bag contains an adult/family, clean, 60-day supply of individually folded humorous thoughts and one-liners. A chuckle a day and recyclable — It's a gift that keeps on giving! Perfect for anyone who is ill, undergoing chemo, hospitalized, lonely or just feeling blue This is an ideal gift to let your loved ones and friends know you care. Looking for a benevolent project: Simply order our Kits -- or just the Chuckles for your own creative packaging. This makes an ideal group project to give to shut-ins. Ready to Go - complete with a signature card! We will ship directly to your recipient. Chuckle Bag: Ready to give or/and shipped to your recipient........:Just $32.05 ea. Coming soon: Chuckle Bags for the child's spirit!